A tried and true element of chiropractic therapy is the targeted application of heat, cold, electricity and ultrasound waves to relieve pain and blockages in the neck and spine. In the old days, the applicators and pads used for these treatments were sort of rough and ready, e.g., an icepack or a heated washcloth or a shock machine that covered a wide area of the back. The Thermostim Solaris Plus takes a lot of the discomfort out of this process, by eliminating the need for excess application of heat or electricity over a wide area of the back while allowing for more aggressive treatment of a tightly-defined target area. 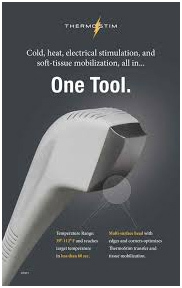 The Solaris Plus Series offers the most options in any one device by including ultrasound, 7 Stim waveforms, and the option of adding Tri-Wave Light Therapy and ThermoStim:cold, heat, electrical stimulation, and soft-tissue mobilization, all in one Tool. The multi-surface head with edges and corners optimizes ThermoStim transfer and tissue mobilization.